Fancy a quick family getaway but money an issue? You’re in luck! 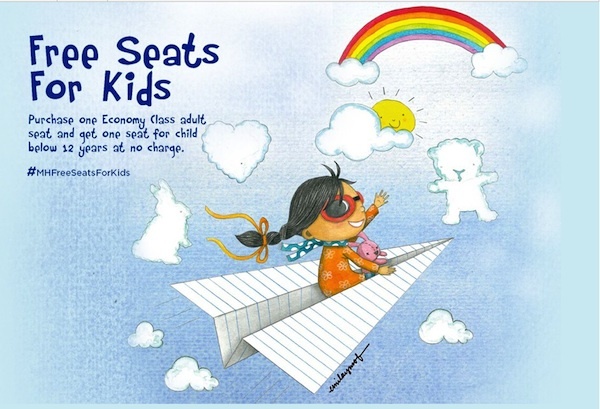 Bring your kids on a quick getaway with Malaysian airlines new promotion; If you book from now until 20th May 2013 for the travelling period until the 31st of May, every Adult ticket booked with MAS will allow an under 12 year old child to travel for free! This is a perfect means to bring the family on holiday for cheap(er). Book your flights at your nearest travel agent or MAS Ticketing Office. Booking period: 29 Apr 2013 to 20 May 2013. Travel period: 29 Apr 2013 to 31 May 2013. Eligibility: For every paying adult flying out from Kuala Lumpur, one accompanied child or infant is entitled to fly for free. Valid for Economy Class purchases only. Not applicable for promotional fares. Complimentary child ticket applicable for first accompanied child. For second child onwards, normal fares will apply. Valid for all international sectors, except for Kuala Lumpur-Kathmandu, Kuala Lumpur-Mumbai, Kuala Lumpur-Chennai, Kuala Lumpur-Bangalore and all domestic sectors. Promotion is not applicable during peak periods, demand flights and subject to seat availability. Not applicable for online bookings. Bookings can be made via travel agents, Malaysia Airlines ticket office or by calling 1 300 88 3000. Celebrate Caturday with Neko Font - the Ultimate Feline Lover's Font...Or Maybe Not.